The word Manestra in Greek is used especially to mean orzo but also for spaghetti. It is a popular dish served with beef. 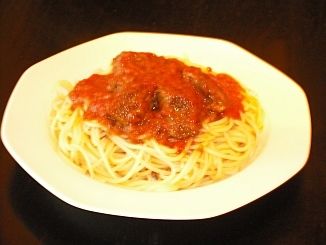 The photo above shows it with spaghetti, where the beef sauce is served on top, but if you use orzo, it is mixed in with the sauce before serving. The recipe below is for both. Put the oil in a deep pan and warm up. Wash the beef and place on absorbent paper to dry. When the oil is warm, add the beef so that all the pieces are touching the bottom of the pan. Heat it for approx. 5 minutes until it colours and then turn over the beef for another 5 minutes to colour on the other side. Add the red wine, wait for 2-3 minutes and then remove the beef and set aside on a platter. Add the onions to the oil and fry for 5 minutes. Add the tomato puree and mix well for 2 minutes. Add the grated tomatoes, cinnamon, cloves and allspice. Put the beef back in and add 500ml warm water – enough to cover all the meat. Cover the pan and simmer for approx. 90 minutes, stirring occasionally and making sure there is enough water. After 90 minutes, if there is still too much water, remove the cover and continue simmering until there is just the sauce left. When it is ready, remove the cinnamon stick, cloves and allspice. In another pan of boiling salted water add the spaghetti or orzo and when it is ready drain in a colander. If you are using spaghetti, put it back in the pan, add 2 tbsp olive oil and stir. Serve it onto individual plates and put the sauce on top. If you are using orzo, once you have drained it, add it to the sauce in the pan and mix.